"...Out of the 53 babies from the 6 pairs of birds I had last year I lost 1 blue. Your products and Dr. Marshalls book and programs can attribute to that." An understanding and knowledge of the requirements of birds in the wild is the basis of Dr. 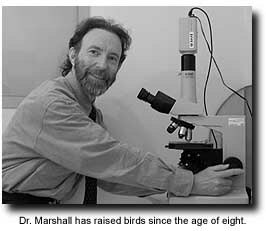 Rob Marshall's approach to bird health. 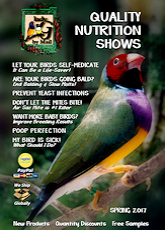 He has developed specialized health programs and health products that protect and enhance the health of all birds in a purely natural way. This is what first attracted me to Dr. Marshall. His approach to good health in flock birds relies upon the selection of vital breeding birds and the use of health programs to promote a strong natural resistance against disease. His doctrine nurtures natural health and minimizes the use of medicines allowing the flock to thrive in a purely natural way. I have been using Dr. Marshall's system and products on my flock for 9 months. The birds look better than ever, but what I like most is his Pro-Active approach to bird health. His Megamix Water Cleaner has been a "life-saver" to my flock, as they are housed in the very humid wet weather here in Georgia. For years their droppings have been loose and watery. I am glad to report that thanks to Dr. Marshall's Megamix, their droppings are once again small and firm, and their overall health is outstanding. Rob Marshall graduated from the University of Sydney in 1975. He established the Carlingford Animal Hospital, a bird, cat and dog practice, four years later and still practises from there. Rob has had a lifelong interest in birds, particularly pigeons, which he races as a hobby. He has been fortunate in being able to study overseas on several occasions, in the USA, Germany and the Netherlands, to further advance his knowledge. He received his Membership of the Australian College in 1988. Rob has been a prolific avicultural author over the years, writing several books, book chapters and magazine columns. He is the author of "A Guide to Pigeon Health", "Health Programmes for Racing and Show Pigeons", "Pigeon Medicine", "Budgerigar Medicine", "Squab Pigeon Production and Health", "Gouldian & Finch Health", "Canary Health" and "Pigeon Health". He has been a co-author for several ABK "A Guide to" books, including Grass Parrots & Neophemas, Rosellas, Gouldian Finches, and Eclectus Parrot (first edition and now the revised edition). He is a regular columnist in the Pet Industry News and a regular nature writer of bird stories for the popular press "Northern Beaches Journal." Rob has also produced two videos on pigeon health: "The health management of Racing Pigeons" and "Super Health in Racing Pigeons." He has lectured at several veterinary conferences, both in Australia and in the United States. In 1991 he won the national Beecham Prize for most interesting original clinical case presentation entitled "Pyometron in a Sulfur Crested Cockatoo". He had a paper on "Anthelmintics and Antiprotozoals for Birds" published in the international scientific journal "Seminars in Avian and Exotic Pet Medicine". 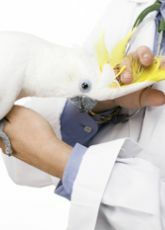 Rob also conducts seminars for clients on pigeon, budgerigar and canary health and disease. He has also assisted in the production of a code of practice for keeping racing pigeons in South Australia and Western Australia. He is a member of the Animal Ethics Committee at Macquarie University, Sydney. In 1995 he was the veterinary consultant for the Northern Territory Nature and Conservation Commission for a scientific study of the disease status in wild population of the endangered Gouldian Finches as it related to a "Recovery plan". This entailed field work on the endangered Gouldian Finch in the Kimberley, Western Australia and Keep River National Park Northern Territory, funded by the Nature and Conservation Commission of the Northern Territory. Rob's current veterinary interests are focusing on wild bird biology and ecology as it relates to captive birds, especially pigeons, exhibition budgerigars, Gouldians, and the Eclectus. To this end, he has conducted field research into the biology of the wild budgerigar and the Gouldian Finch. These trips have taken him to western NSW and the Northern Territory, where he collected samples to analyse the diet of wild birds and their normal bacterial flora. Other research projects have included microscopic assessment of budgerigar feathers to examine the structure and colour theory of exhibition budgerigars, and causes of breeding failure of the Australian Eclectus (E.r.macgillivray). Away from work his interests include his family, Aboriginal affairs, creative writing painting, photography, sculpture, and running. He is married with 3 children (8yrs, 13 yrs, 15 yrs). Dr. 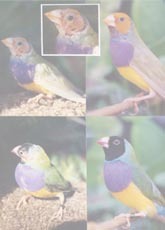 Rob Marshall knew if his health programs and products were successful with the most fragile members of the finch family, the beautiful mutation Gouldian Finch, then they would be extremely useful for all seed-eating birds. Dr. Rob's new book, Gouldian & Finch Health, is written from the bird keeper's rather than the veterinarian's perspective on health issues of finches, providing exact methods for a practical and simple health program. 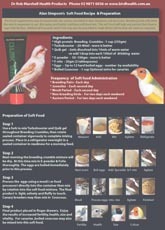 The book is a great reference and "self-help" book about the proper care of finches.